Has the underemployment rate topped out? Has the trend of rising underemployment rates for new college graduates finally turned a corner? While unemployment rates improved over the last few years, underemployment rates have only started to drop more recently. The unemployment rate for recent college graduates began to fall in 2011, and it has continued to do so—with a hiatus during 2013—ever since. However, aside from a brief dip in early 2011, the underemployment rate continued to climb well into 2014, rising to a level of more than 46 percent. This divergence between falling unemployment and rising underemployment between mid-2011 and mid-2014 suggests that more college graduates were finding jobs during this time, just not necessarily good ones. The steady growth of non-college jobs, coupled with the relatively soft demand for college graduates during this three-year period, appears to have forced many recent college graduates to take jobs not commensurate with their education. More recently, though, the tide has turned. With the demand for college graduates rising at a solid clip since last summer, underemployment has also finally started to come down. Since last June, the underemployment rate for recent college graduates has fallen by about two percentage points, to 44.6 percent. The underemployment rate is still historically high. While these trends are no doubt good news for recent college graduates, it is important to keep the gains in perspective. As we have shown before in this post and this article, the underemployment rate for recent college graduates remains quite high by historical standards. At 44.6 percent, we estimate that nearly half of this group is working in jobs that typically do not require a college degree—a rate that is much higher than when underemployment hit a trough of around 38 percent in 2000. 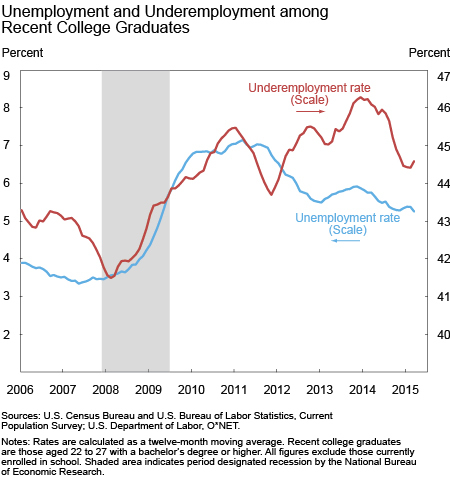 And while the demand for college graduates appears to be picking up, significant labor market slack remains, so continued strong growth in the demand for college graduates may well be necessary to make a more serious dent in the underemployment rate. The Washington Post has an optimistic view. For now, I’ll wait and see. Jaison R. Abel and Richard Deitz, “The Class of 2015 Might Have a Little Better Luck Finding a Good Job”, Liberty Street Economics, May 15, 2015. 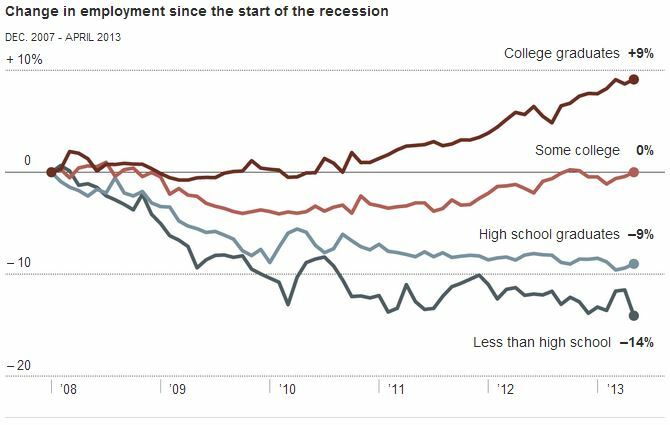 Posted in jobs after college, post-college life | Comments Off on Has the underemployment rate topped out? There was a time not long ago when internships were reserved for college students. But that era is passing, with loosely defined internships — some paying a small stipend, some nothing — replacing traditional entry-level jobs for many fresh out of college. The moribund economy is, without question, a primary factor behind the shift. Even though the employment picture has brightened since the depths of the Great Recession, few would describe it as sunny. The general unemployment rate inched down to 6.6 percent last month, but the jobless rate for college graduates age 20 to 24 stood at 8 percent in 2013, compared with 5.1 percent in 2007, according to the Bureau of Labor Statistics. Actual measurements are lacking, but with recent college graduates suffering the worst unemployment rates in 50 years I don’t doubt this trend is real. The new “culture of internships” seems strongest in the media field, although high-tech start-ups also draw in workers willing to work for little or no pay. While many young college graduates accept the meager opportunities because they are grateful for any chance to work in their chosen field, there is a revolt underway among a small contingent of dissatisfied workers. Lately, however, long-suffering interns are starting to do more than complain. They point to the Labor Department’s six criteria for legal internships, which stipulate that companies that do not pay interns must provide vocational education and refrain from substituting interns for paid employees, among others. Those rules have been highly open to interpretation and their enforcement is sporadic. But some desperate millenials still prefer internships over less “meaningful” employment. Last October, Condé Nast announced that it was ending the internship programs within its 25 magazines, which means that 20-something aspiring magazine editors will have one less place to get a toehold for their “meaningful” careers. Many of these “permaterms“ have no choice but to continue living at home. As American college completion rates continue to climb, George Will foresees a time when society will sharply distinguish “between those with meaningful college degrees and those with worthless ones”. Today, the dominant distinction defining socioeconomic class is between those with and without college degrees. Graduates earn 70 percent more than those with only high school diplomas. In 1980, the difference was just 30 percent. Soon the crucial distinction will be between those with meaningful college degrees and those with worthless ones. Many colleges are becoming less demanding as they become more expensive: They rake in money — much of it from government-subsidized tuition grants — by taking in many marginally qualified students who are motivated only to acquire a credential and who learn little. Today’s “college students are learning less than they used to”. Lindsey reported that in 1961, full-time college students reported studying 25 hours a week on average; by 2003, average studying time had fallen to 13 hours. Half of today’s students take no courses requiring more than 20 pages of writing in a semester. Given the role of practice in developing expertise, “the conclusion that college students are learning less than they used to seems unavoidable.” Small wonder those with college degrees occupying jobs that do not require a high school diploma include 1.4 million retail salespeople and cashiers, half a million waiters, bartenders and janitors, and many more. 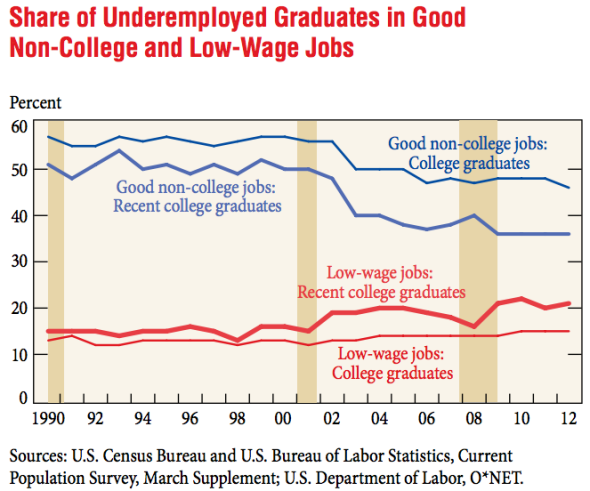 Most college graduates are underemployed, as shown by the chart on the left. 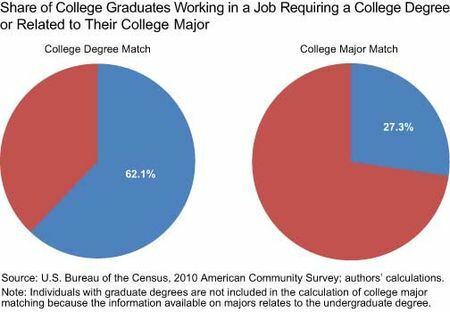 The chart on the right shows that the vast majority of college graduates are working in fields unrelated to their undergraduate major. This comes from research produced by Jaison Abel and Richard Dietz of the Federal Reserve Bank of New York. … We utilize newly available census data that identify both an individual’s level of education and, for college graduates, undergraduate college major. We construct two measures of what we call job matching for those with a bachelor’s degree. Our first measure, which we refer to as college degree matching, determines whether an undergraduate degree holder is working in an occupation that requires at least a bachelor’s degree. Our second measure, which we call college major matching, gauges the quality of a job match by identifying whether a person is working in a job that corresponds to that person’s undergraduate major. For example, consider a college graduate who majored in Communications. If this person worked as a public relations manager, an occupation that both requires a college degree and relates directly to a Communications major, we would classify this person as matching along both measures. By contrast, if this person worked as a retail salesperson, he or she would be classified as not matching along either measure. Being overqualified is sometimes the only way to secure employment and pave the way for future career growth. 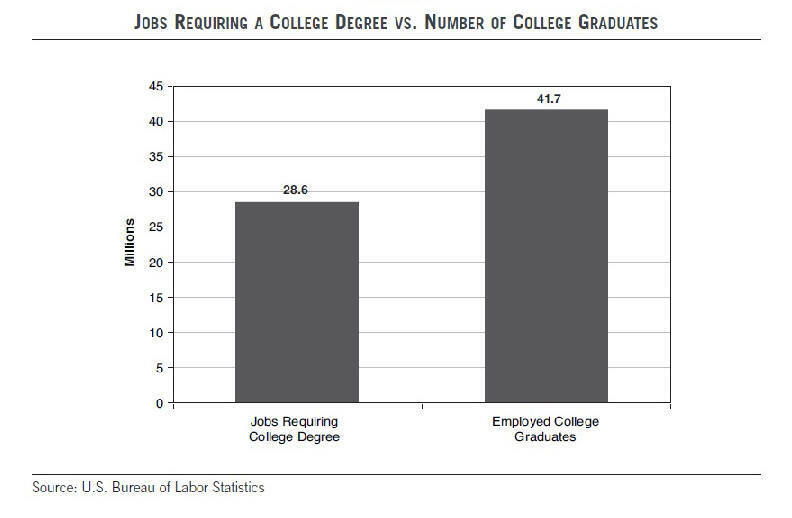 This data does not necessarily support the argument that a college degree is a waste of time and money for most. In a perverse way, it actually supports the importance of going to college. In this jobless economic recovery we have too many college graduates chasing too few college-level jobs, so employers can screen out job applicants who lack a college background. Those retail salespeople, office receptionists, or any number of similar workers with college degrees were probably helped in gaining employment by the fact they had demonstrated the persistence and intelligence needed to complete four years of higher education. It also helps their chances of future career and income growth. A law school graduate blogging about “the loss of my last shred of dignity” while working at a store counter selling cologne is featured in a Business Insider story. The blog’s anonymous author graduated from a law school that was in the top 50 ranked by U.S. News and World Report. He was on law review and even got a summer position at a firm after his second year. He didn’t get a job offer though. Is this the ‘definitive guide’ to the college grad job market? Jordan Weissmann wants to set us straight about the job market for college graduates. He thinks the press has been overly pessimistic about the value of a college degree, and he offers a “definitive guide” summarized in five points. Very importantly, career prospects vary according to individual circumstances because the college premium depends on factors like college major, ability bias, and reputation of college. 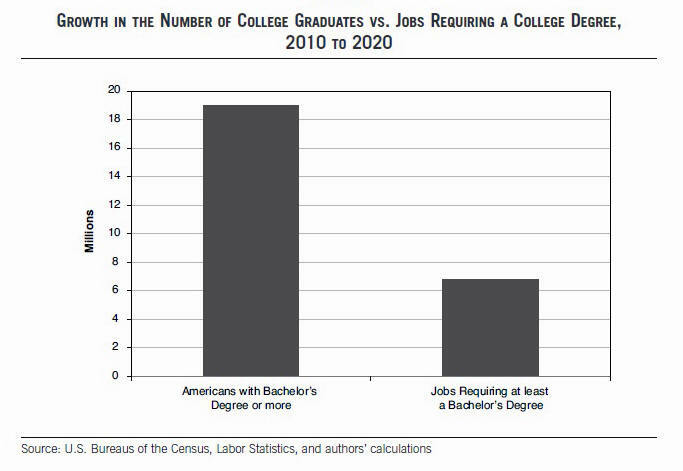 And Weissmann’s last point may be the most instrumental in affecting the college graduate job market. A booming economy makes every college degree more valuable. Prosperity covers all sorts of sins, and helps win elections. Remember this? 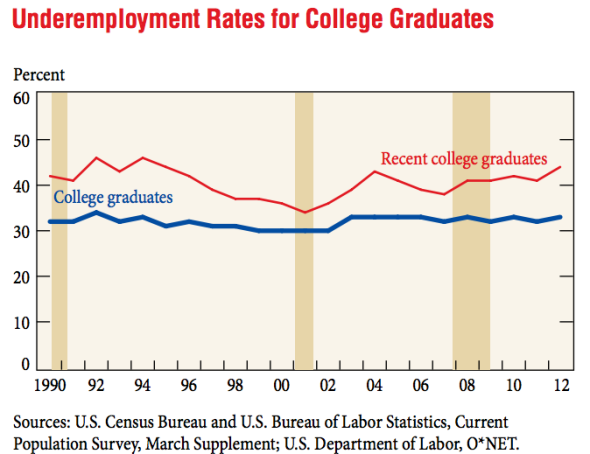 Will underemployed college graduates be able to recover from a tough economy this time around? Previous generations of college graduates who had the bad luck to graduate during a tough economic environment have been able to recover, albeit after spending years stuck in a “wage rut”. College graduates entering the labor market in a recession experience reduction in earnings of 10 to 15 percent lasting about 10 years or more. 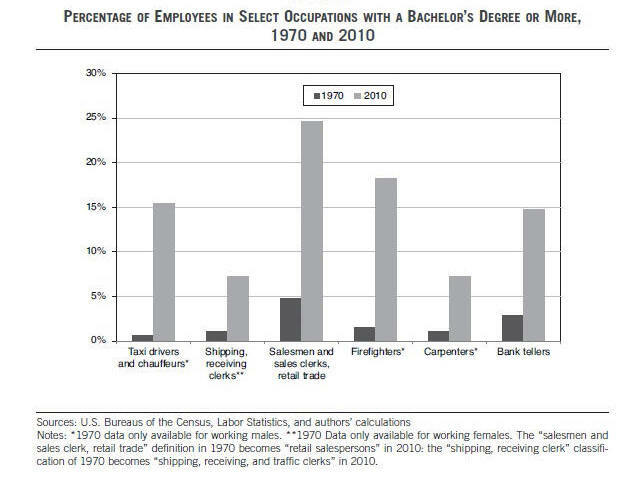 Will young workers graduating from college today be able to recover in a similar fashion? There are reasons to believe the underemployment problem is more severe this time. … in a paper released Monday by the National Bureau of Economic Research, a team of Canadian economists argues that the U.S. faces a longer-term problem. They found that unlike the 1990s, when companies needed hundreds of thousands of skilled workers to develop, build and install high-tech systems—everything from corporate intranets to manufacturing robots—demand for such skills has fallen in recent years, even as young people continued to flock to programs that taught them. “Once the robots are in place you still need some people, but you need a lot less than when you were putting in the robots,” said Paul Beaudry, an economist at the University of British Columbia in Vancouver and the paper’s lead author. New technologies may eventually revive demand for advanced skills, he added, but an economic recovery alone won’t be sufficient. Okay, the problem of technology destroying jobs is not without precedent But we do not seem to be generating enough “replacement” jobs for college graduates. 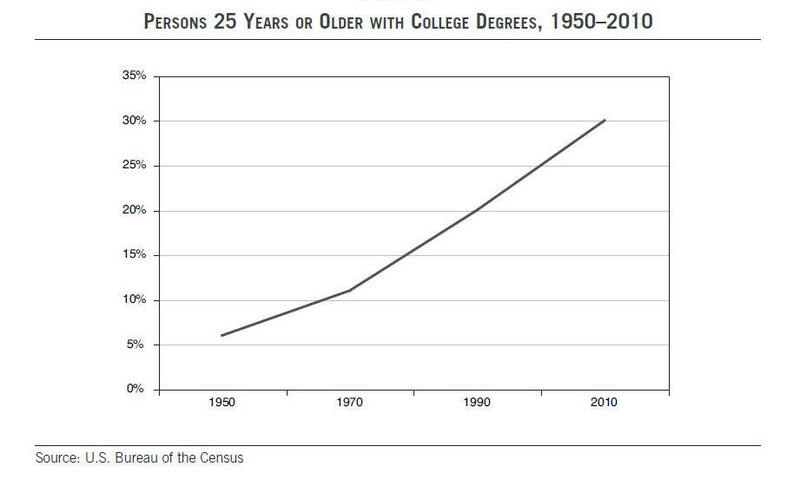 … what has happened over time is that the proportion of the workforce with college degrees has grown far faster than the proportion needing those degrees in order to fulfill the needs of their jobs, forcing a growing number of college graduates to take jobs which historically have been filled by those with lower levels of educational attainment. The reality is that many jobs in the United States do not require a lot of education to perform, even though they may require on-the-job training, sometimes in considerable amount. Today’s record student debt burden is a new factor that did not affect previous generations of college graduates. By limiting flexibility in the types of career opportunities workers can pursue as well as undermining the overall economic recovery, it inflicts a double whammy on recent college graduates. I’m usually optimistic about my children’s economic opportunities, but some days it’s hard to raise a cogent argument against a doomsday scenario. Sometimes I just revert to a simplistic faith in the positive aspects of human innovation and determination that have saved us in the past. “Nearly half of working Americans with college degrees are in jobs for which they’re overqualified“, according to study released last month by the Center for College Affordability and Productivity. At the core of this issue is the problem of too many college graduates chasing too few college-level jobs. 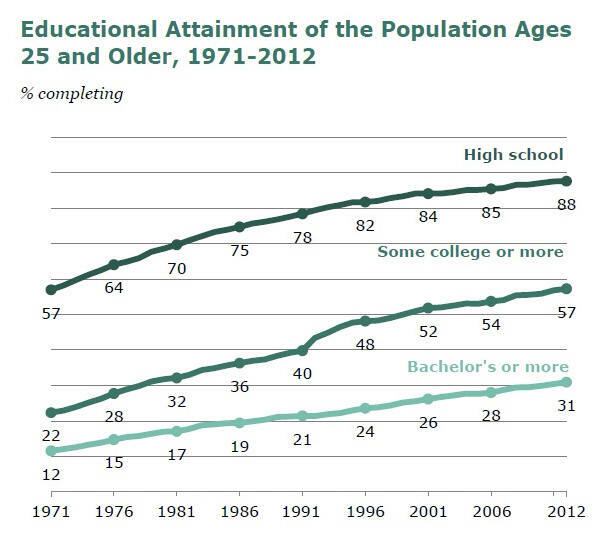 The proportion of the adult population with degrees has dramatically increased with the passage of time. 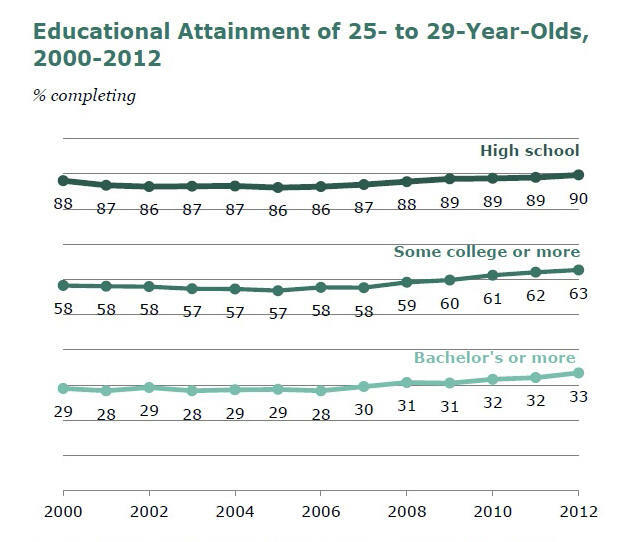 Figure 3 shows that the proportion of adults with degrees in 2010, 30 percent, was five times what it was 60 years earlier. In 1950 or 1960, college graduates constituted a single digit proportion of the adult population—almost by definition, an elite group. As we will soon demonstrate, what has happened over time is that the proportion of the workforce with college degrees has grown far faster than the proportion needing those degrees in order to fulfill the needs of their jobs, forcing a growing number of college graduates to take jobs which historically have been filled by those with lower levels of educational attainment. The reality is that many jobs in the United States do not require a lot of education to perform, even though they may require on-the-job training, sometimes in considerable amount. The phenomenon of the college-educated person holding a job requiring little formal education training appears on the basis of this type of evidence, at least for the occupations we examine, to have arisen mostly in the past four decades or so. The authors consider whether our country’s spending priorities have produced a waste of resources, leaving us with a society that is not only underemployed but overinvested in higher education. They also consider whether this is the time for government to step back from its involvement in higher education and let the market take care of this situation. Many college students today are learning (or relearning) skills and knowledge that formerly were taught in high schools. Textbooks have been dumbed down for decades, while more students take remedial English and math courses. Standards are held down by grading on the curve (a mediocre majority sets the class norm) and by the importance of student evaluations of faculty for promotion and retention of instructors, more of whom are desperate adjunct faculty. Tough assignments do not elicit favorable evaluations. Many students work at least part-time, slowing the pace at which they can study. Therefore the function of college today for many students is to provide high school education appropriate to the jobs as in the past except that students formerly attained it by age 18, not 28.